Brett Luke | The Journal Gazette Lenny Bennett runs the ball during Snider’s practice Monday. The Panthers take on Homestead tonight. Brett Luke | The Journal Gazette Lenny Bennett of Snider takes a hand off from teammate Jon Barnes Jr.and breaks through the defensive line while at practice Monday night. 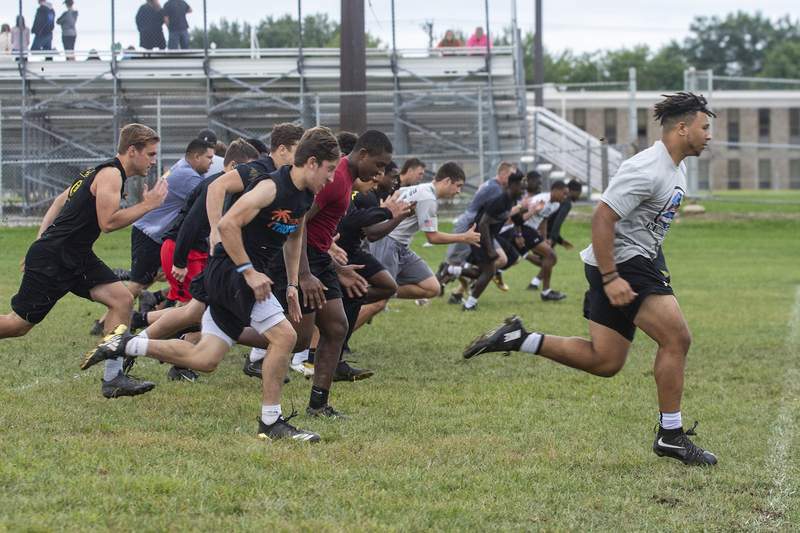 Brett Luke | The Journal Gazette Members of the Snider football team run sprints at the end of practice Monday night. Snider coach Kurt Tippmann said he has always felt that most teams in the SAC had the ability to beat any conference opponent. But this season, those upsets are actually happening. 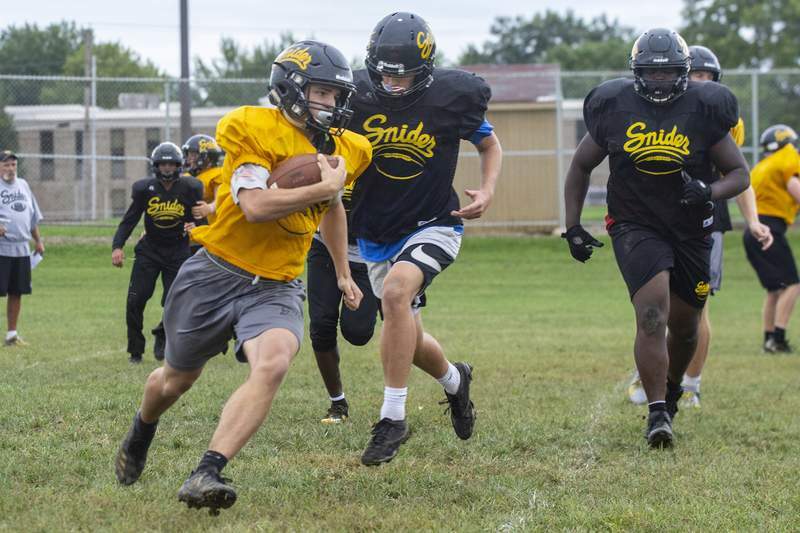 Despite the “any given Friday” talks from the Panthers coaching staff – or, perhaps, because of them – no current player on the Snider roster had been on the losing side of a regular-season shocker coming into this fall. The Panthers ( 3-1) went undefeated in conference play in 2016 and 2017. In 2015, when the seniors were freshmen, Snider's lone SAC loss came by three points to a Bishop Dwenger team that went on to win a state title. But a 38-14 loss to Carroll in Week 2 somewhat dented the air of dominance that Snider has enjoyed in recent seasons. While the Panthers did not respond well to falling behind to Carroll during the game, senior free safety Ethan Hoover, who missed the first two games of the season because of a knee injury, said he thinks the team handled practice and preparation better in the wake of the loss. Snider rebounded with a 37-7 win over Concordia, which included an interception by Hoover in his first game back. He tore his ACL in the sectional final win over Carroll last fall, and though his recovery was relatively quick, he tore his meniscus in the same knee during a non-contact drill this summer. “Missing him for the first part of the season added to some of the growth and struggles that we had, and having him back gives everybody confidence,” Tippmann said. Hoover said that his recovery has been made easier by the fact that he is rehabbing alongside Carroll's Jack Tranquill, who is also nursing a knee injury. He also noted that coming back from the meniscus tear was easier than recovering from the ACL surgery. Hoover said he has worked hard to keep the back-to-back injuries from changing the way he plays. Tonight, the Panthers will play host to Homestead (2-2), another Class 6A team that was dominant in 2017 (at least against every team not named Snider) but which has stumbled in the last two weeks. Tippmann said the entire program was relieved to see Hoover back and performing well on the field, but he hopes the senior will have more highlights before the end of high school career. “His first game back, I think it was his first or second series, and he got an interception, and everyone went, ahh, he's back,” Tippmann said.